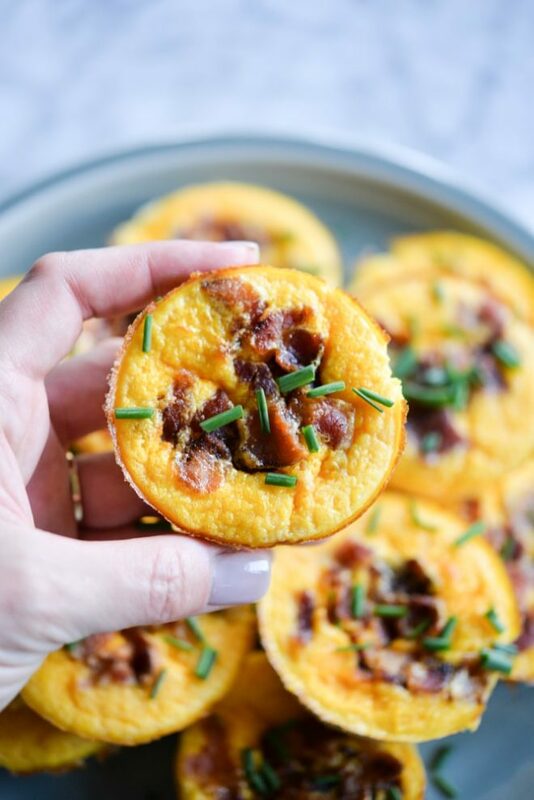 These Paleo Butternut Squash Egg Muffins are a great make-ahead breakfast option that freezes, travels, and reheats really well. PHEW, that's quite a list …but I'm not the kind of girl that backs away from a challenge. We got to work! We finally settled on this little gem of a recipe, the Butternut Squash Egg Muffin! The concept is simple. First, roast some butternut squash. For this step, you can either use a whole butternut squash (like we did) OR you can make things easier (see request #2 above) by roasting pre-cubed fresh or frozen squash. We're not looking for any special texture on the roasted squash, just that it's cooked through. From here, it's a downhill ride. Let the squash cool enough to handle (meaning, you can touch it without burning a finger) and then add it to a blender. Plop in about 18 eggs (or less, if you're making a smaller batch), season, and blend until smooth! Pour the mixture into a muffin tin lined with parchment liners or into a greased silicone muffin pan. 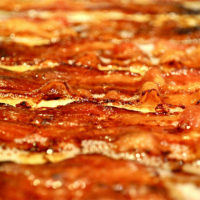 Sprinkle the tops with crumbled pieces of bacon and bake until firm. Let them cool enough to handle and then enjoy right away. OR, if you're wanting to stash these Butternut Squash Egg Muffins away in the freezer, I recommend wrapping 2-3 muffins (about a serving size) in wax paper, taping the package closed, and placing in a gallon freezer bag that you've labeled. Oven method: place the frozen muffins on a baking sheet, spread out as much as possible. Place in a *cool* oven and turn oven on to heat to 350 F. Once at temperature, cook for an additional 5 minutes, or until warmed through. Note: if your oven is one that blasts HIGH heat to bring the box up to temperature, you'll need to put the frozen egg muffins in once at temperature – baking for at least 10 minutes. Microwave method: place the frozen egg muffins on a plate, cover with a paper towel, and microwave for 2-3 minutes, or until warmed through. Stove method: place the frozen egg muffins in a skillet over medium heat and cover with a fitting lid. Once they've defrosted, remove lid. Let them cook for an additional 5 minutes, or until warmed through. 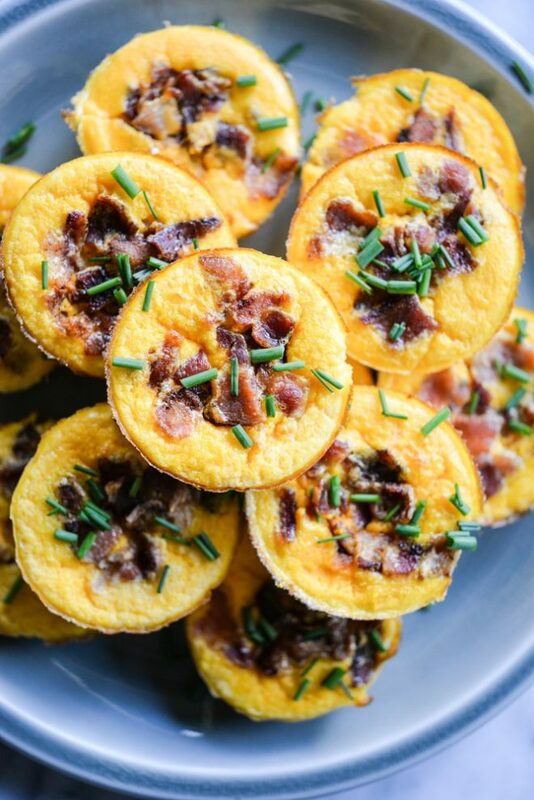 Butternut Squash Egg Muffins! BING, BANG, BOOM. I hope you love this recipe as much as we love solving riddles for you! You can also check out our Balanced Breakfast Egg Cups for another make ahead friendly breakfast option! Cut butternut squash in half, scoop out the seeds, and place in Instant Pot, on trivet, with 1 cup water in the bottom. Set to Steam for 12 minutes and wait a few minutes before quick release. Thank you so much for sharing, Richelle! I can’t wait to try these! I think my kiddo will especially enjoy them. I was curious as to how much puree I should expect from the butternut squash? I noticed canned organic squash at my local grocery store and I was thinking about substituting it when pressed for time. Good question!! I would say between 3 and 4 cups. These are the best! 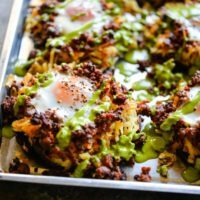 Perfect way to get an extra serving of veggies in for my kiddos and the morning, so great to have ready for early and busy mornings AND they taste delicious. Thank you for this recipe! I’m so glad you like them, Melanie! How long will they keep fresh in the fridge and how long to keep in the freezer, if needed? Also, as with several of your other recipes, to freeze these egg cups, should they cool for about 30 min after baking and then put in freezer? 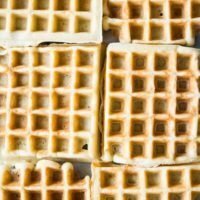 Love your recipes & blog! You are so fun to follow! Hello again! This was a wonderful, tasty breakfast option for me- I made it for breakfast this week. I ran in to a small problem, which has happened before when I’ve made egg “muffins” – the eggs cups stick like crazy to the muffin tin! I tried to add extra oil to the pans to preemptively prevent this but to no avail. In the past I’ve used parchment paper cups, but had mixed results of egg sticking. Any suggestions? Hi Clare! If your muffin tin is metal, it will absolutely stick. If it’s silicone and still sticking, I recommend greasing thoroughly and, if they’re still sticking, try cooking a bit longer and then letting them cool *completely* before removing from the pan. Unfortunately, they’re just a sticky-prone food. I hope that helps some! Hello Cassy dear! Met with a potential GF Pastry Chef last week for Sara’s wedding cake and he was SO impressed that I knew you! 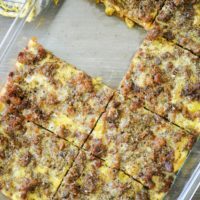 So I was contemplating making this as a large quiche-type quick breakfast next week after we get home from Turkey Day 5K! Do you think it could be poured into a 9×13 dish and baked ahead and then reheated? And if I don’t have a blender, could I just use a hand mixer or should I do the food processor? I think it could work!! I’d bake it a little longer, just to be sure that it’s cooked-through. Also yes, food processor would work great. What kind of muffin pan did y’all use? I buttered mine but they really stuck. Silicone. Note that if they’re more likely to stick if still warm. What is the texture of this? 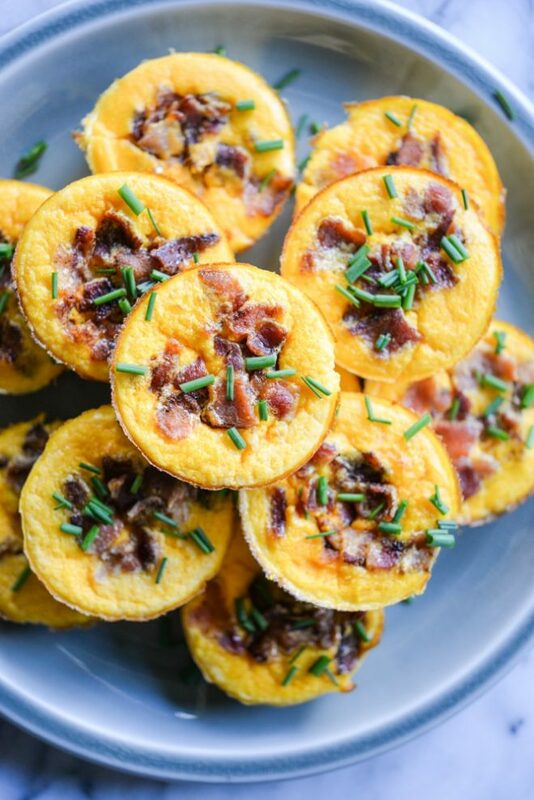 I’m getting so tired of frittata or egg muffin texture and was hopeful maybe adding butternut squash might make it less eggy?